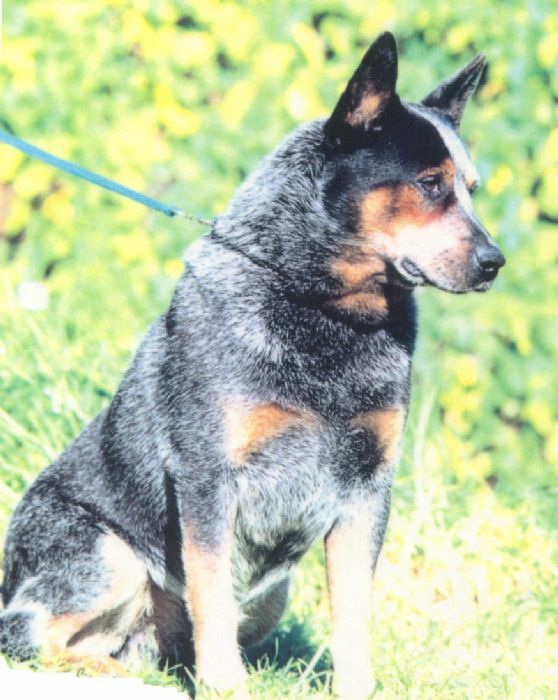 From the mating of sire Stillan Blue Buddy and dam Ch Meroolestate Kristie producing 7 pups, 6 males, 1 female on 11 June 1985 came this long legged, big headed, clumsy male who was to be the greatest winning ACD’s in the history of the breed. He was named after the opening of a large supermarket in our area called Super K Mart, and his call name “Sao”, after a very famous Australian product. His show career commenced relatively uneventfully. Not until he gained his first Best in Group at nine months of age did I really consider that I would persist with this clumsy dog. At eighteen months of age and a lot of growing later, he gained his title as well as winning Best in Group and Runner Up Best in Show at a major Sydney Show with an entry of some 1800 dogs. I still remember the first person to congratulate me as I left the ring, an old breeder who had told me way back in the beginning of “Sao’s” career that this dog will be the best, saying “I wasn’t wrong, was I”. 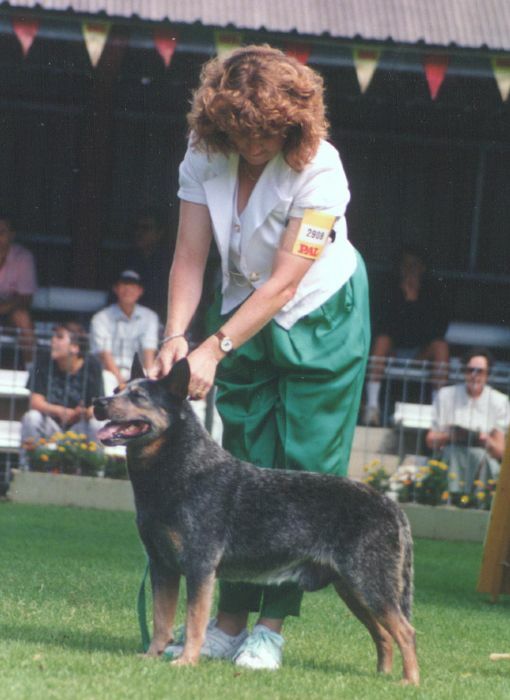 Sao’s next big event was the Australian Cattle Dog Society of NSW Specialty in September 1987. Mr Alan Gammidge took him from the Intermediate Class to the Dog Challenge Certificate and Runner Up Best in Show. What an exciting win it was! The general feeling of the “establishment” was “beginners luck”! They were not quite so forgiving when he won Best in Show at the Australian Working Dog Club of NSW show only 3 weeks later. From that point on he never looked back. 1988 and it was the Bicentennial Year in Australia. A tremendous amount of work had gone into holding the first Australian Cattle Dog National Show in conjunction with an Australian Breeds Bicentennial Spectacular. All the Australian breed Specialties were held on the one ground and the Best in Show winners from each of these specialties went on to compete for Best Australian Breed. It was the biggest single event in the history of our breed with exhibitors coming from every State of Australia. Mrs Carmyn Kingston, a great lover of the breed officiated at the event awarding “Sao” Best in Show. We then competed against all of the other Best in Show winners to be awarded Supreme Exhibit Australian Breeds Bicentennial Spectacular. Even the torrential rain on the day did not dampen my excitement at winning such a prestigious event. 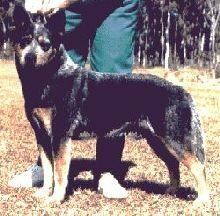 Sao continued his winning ways, being Number 1 Working Dog Australia wide for 1989 and 1990 and Number 3 Dog in Australia 1989. He was highest scoring Working dog, Dalwood Dog of the Year for 1991, plus won many many breed and group point scores for the years of 1989, 1990, 1991 and 1992. He was retired in October 1993 on his 20th Best in Show. He also won 21 Runner Up Best in Shows including the 1990 Launceston Royal, 68 Best in Groups and over 100 classes in group and in show awards. I had achieved my goal. To have the greatest winning dog in the history of the breed. In the latter stages of his life ‘Sao’ battled with prostrate cancer and one of the saddest days of my life came on May 1 1998 when I said goodbye to my best friend.